Gluegroup is based in Heaton, Newcastle-upon-Tyne. We have established our gallery in the shop front of Arthur T. Sharpe’s tattoo parlour, on Heaton Road. 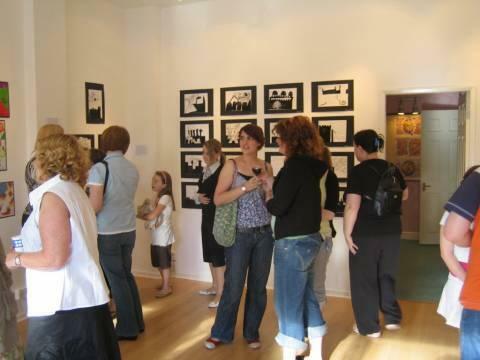 The gallery provides opportunities for established local artists, and also encourages and facilitates the move from university to professional practice, giving university students and new graduates the chance gain experience and exhibit their own work. The New Year is packed with exciting new projects for us…. We shall be kick starting the next instalment of our education programme at St.Teresa’s Primary School with drawing, printing, and sculpture based workshops. Plans are being made for an upcoming exhibition at Durham Art Gallery. This will be in conjunction with ‘My Giant Colouring Book’ by Jake and Dinos Chapman and an exhibition of new Polish art (more details of this to come). We are currently looking for 2D artists, and are keen to receive proposals for painting, photography, print and written word – work to represent, document or simply express the joy many of us find in having a good old dance! Gluegroup invite you to lend your support and good company for the first ever Stray Signals! It is hoped that this night of performance art, poetry and storytelling will become a regular monthly event. We are aiming to draw from the finest of the Northeast’s performers, whilst also remaining open to anyone just turning up, having a go, and enjoying the collective creativity. The focus will always be on fostering an atmosphere to create original material, have fun, and test things out. You can also search for and join the Facebook group of the same name, where you can see new posts and updates. ‘Serious Playtime’ came and went in a whirlwind of activity providing an array of exciting artworks and performances. Following their exhilarating multimedia performance on the opening night Paul and Ritchie Dixon led a daylong gun-making workshop. The gallery was overrun with sticks and branches, hand tools, power tools (for the few who cheated) and a variety of binding materials. Designs were chosen and building commenced. Materials and tools were promptly put into action and wood shavings started flying. Everyone who attended went home with the satisfaction of having created a beautifully handcrafted gun. The Dixon brothers hosted an inspiring workshop utilising basic natural materials, calm and experienced tuition a plenty, and ultimately providing a very enjoyable way to spend your Saturday afternoon. Gluegroup were also invited to take part in the Life Work Art conference organised by Newcastle University and hosted by Star & Shadow Cinema. We gave several talks to undergraduate students outlining our progression and experiences with setting up and running the gallery and followed this up in the evening with marvellous performances in conjunction with ‘Serious Playtime’. In order to find time for mince pies and mulled wine we have had a break in programming over the Christmas period. We did however leave the Gallery with a magnificent giant Christmas card wall drawing, a collaboration between Laura Kirby and Steven Walker, alongside paintings by Arthur T. Sharpe’s tattoo artist Daniel Lake. This work can be seen till early January so pop by the Gallery to re-kindle the festive spirit. A dedicated 'Serious Playtime!' website has been set up, which is accesible from our main website. The preview night included a shop front performance by Lady Kitt (in her id Turpin guise), Andrew Sandercock traverse climbing the gallery outside, and a hilarious action-packed multimedia performance by Paul and 'Big Ritchie' Dixon, showing off their 'Dead Wood Armoury' collection. Since the 'Publish!' exhibition came down, and whilst we take submissions for 'Serious Playtime!' (opening 8th November) Gallery Glue has become host to Newline and friends, a prestigious group of graffiti artists/designers who have also shown at the Baltic for 'The G Word'. We're allowing them complete freedom to adorn the entire space, and there will be a private view this coming Wednesday 24th. We’re nearing the end of ‘Publish!’, a bookmaking themed exhibition including a lively series of workshops. In the past few weeks we’ve had poetry, musical storytelling, interactive typewriting, and workshops in bookbinding and creative writing. We also took part in MIMA art & food fair, ‘The Really Super Market’, where we made vegetable sculptures and instruments with the public. We are now gearing up to our November exhibition, ‘Serious Playtime!’. This will be have the loose theme of ‘play’ and will have strong aspects of performance and audience participation. Gluegroup is an artist collective based in Newcastle Upon Tyne. Our gallery - Gallery Glue - is a space offering a platform for exhibitions, live art events, discussion, training, community exchange and involvement.